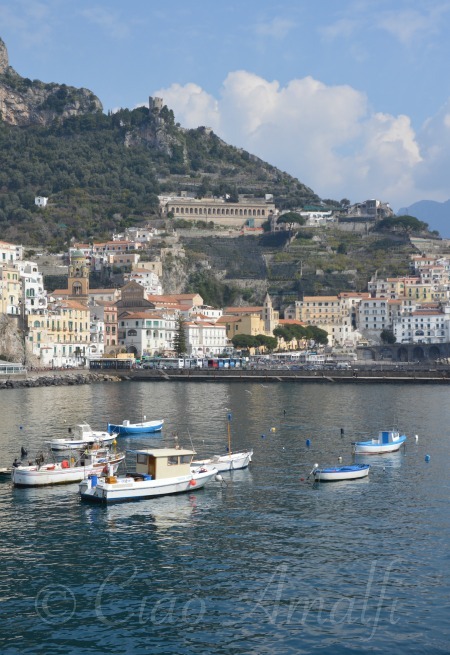 – Seeing the Amalfi Coast by ferry is an experience you won’t want to miss! 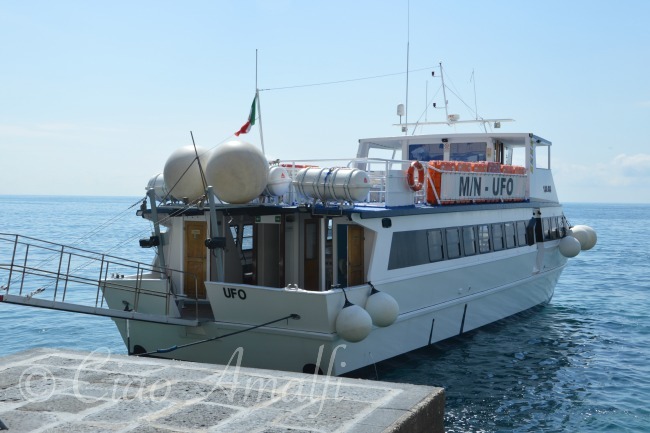 NOTE: Please visit my more recent blog post Amalfi Coast Ferry Schedule 2016 for updated information. 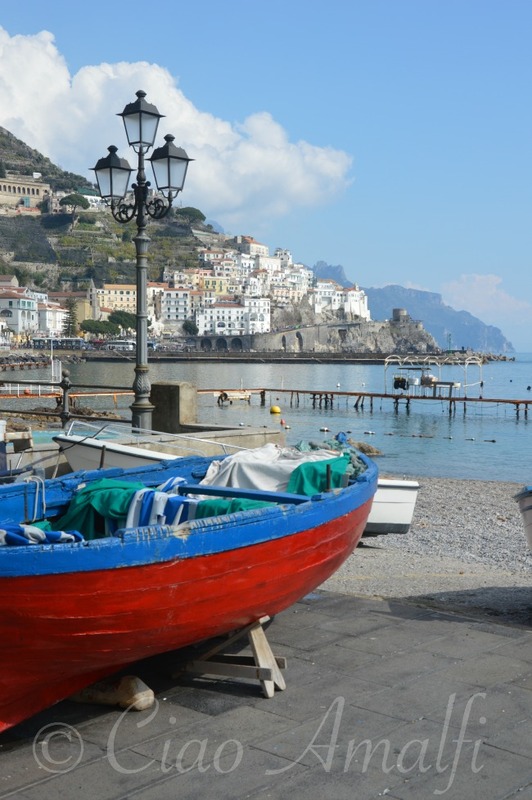 Spring has arrived and Easter is just a week away, which means it’s time for the ferry service to begin along the Amalfi Coast. 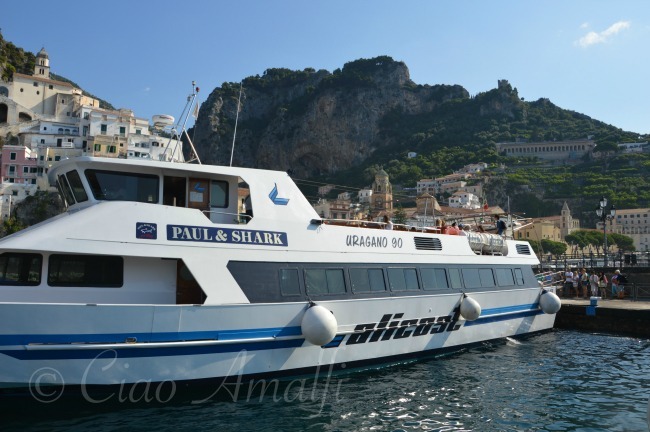 The company Travelmar runs the ferry boats that connect Salerno with Amalfi and Positano, and service begins on April 1st, 2015. 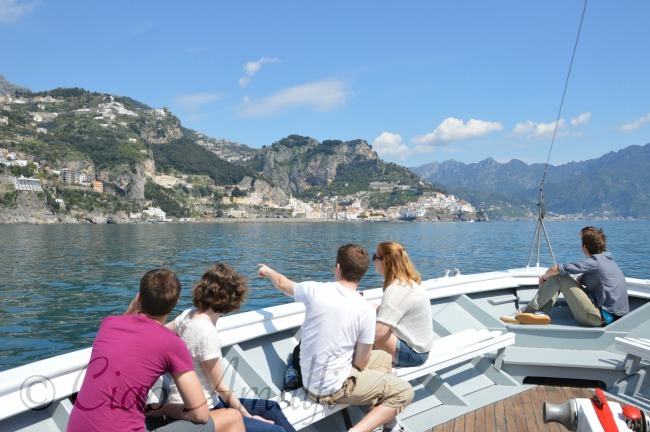 Getting around the Amalfi Coast by ferry is not only more convenient but also a great way to see the beauty of the coastline from the sea. No matter how many times I’ve made the trip up and down the coast, I still get out my camera and take photos. It’s just too beautiful to resist! If you’re staying in Amalfi and would like to see Positano or the other way around, it’s just a 30 minute ferry ride between the two villages. All of the boats have an open seating area on the upper level, which is great for taking photos. Just be sure to bring a hat and your sunscreen as the summer sunshine doesn’t feel as warm as it is with the nice sea breeze. 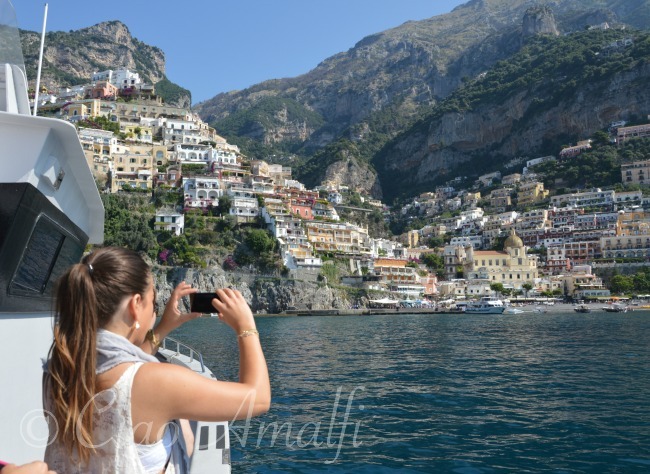 A little tip for taking photos: From Amalfi to Positano you’ll want to sit on the right side of the boat to be on the side closest to the land and the left side from Positano to Amalfi. Besides avoiding the eternal issue of where to park the car or scooter, taking the ferry also means you arrive right in the heart of Positano. Once you step off the boat you’re just steps from the beach and the shops and restaurants are moments away. When the ferries arrive in Positano they turn shortly before the dock and back in. So if you’re sitting on the top level you’ll get a great 360 view as the boat turns! Do keep in mind, however, that since the dock in Positano is open to the sea that for safety the ferries are not able to stop here if the sea is rough. While it rarely happens during the summer, it can happen more often during the shoulder season. 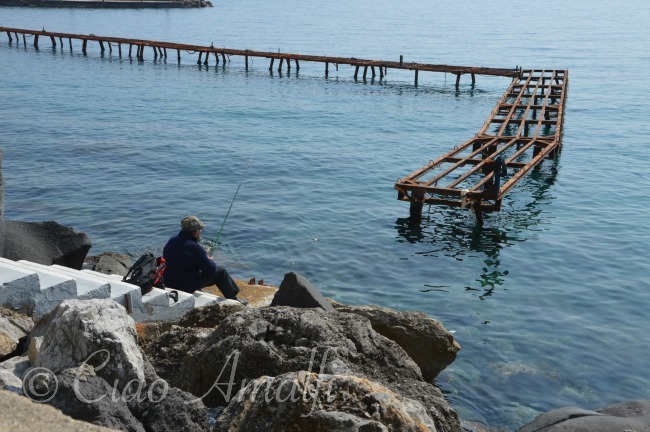 This is less of an issue in Amalfi, Salerno and Sorrento where there are ports. 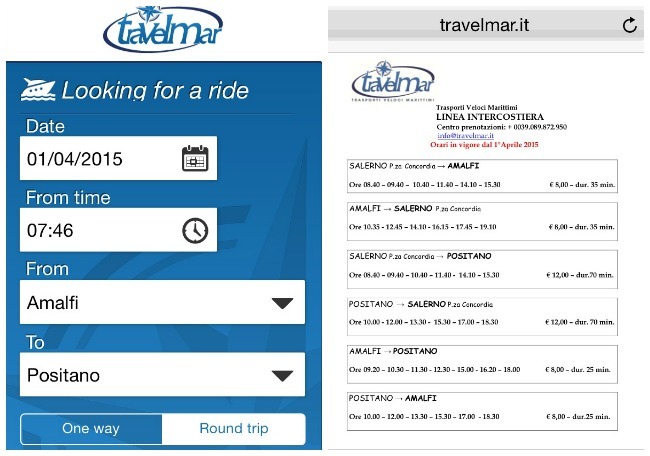 Travelmar has launched a free app that includes their schedule (linked to the website) and the ability to book tickets on a smartphone or tablet and pay with Paypal. 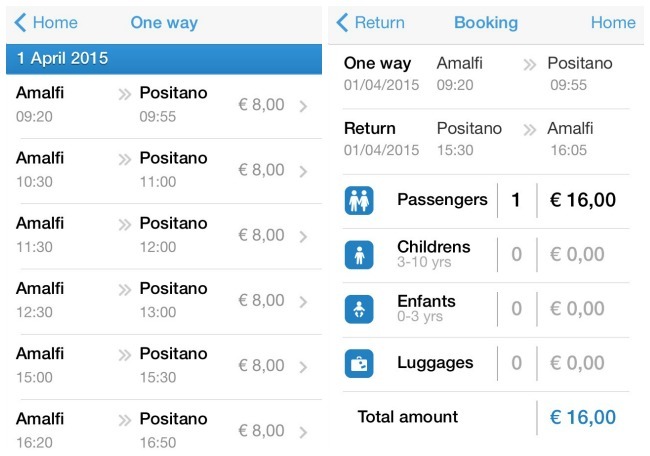 Infants ride free on the ferries and there are reduced fares for children under the age of 10. Don’t forget that if you’re traveling with luggage on the ferry you will have to pay extra, usually about €1.50 per suitcase. Visit the Travelmar website to find out all the details, see the latest schedules and book your tickets online in advance. 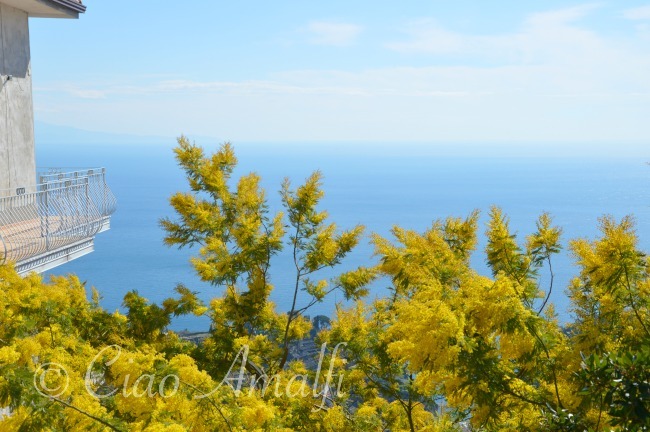 I hope you’ll have a chance to take the ferry on the Amalfi Coast this year! 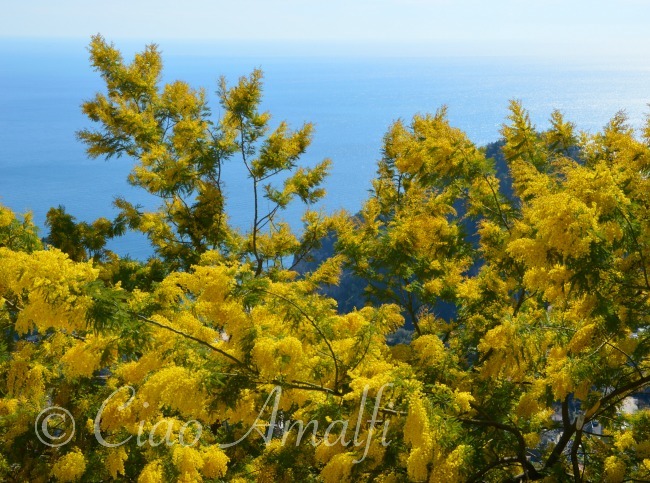 The first signs of spring are starting to arrive on the Amalfi Coast, and yet even more visible is the yearning for the spring everywhere you look. After the cold, humid winter months there’s a physical need for warmth. When the sun shines it’s almost too much to resist. 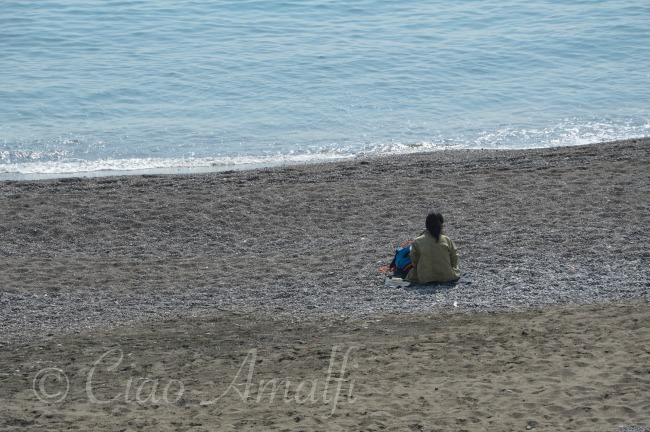 The locals in Amalfi are “street people,” as my husband describes them, and even in the middle of winter you’ll find people out and about walking and talking. However, there’s a palpable sense of joy this time of year when the sun shines, especially on a weekend morning. Everyone seems to find a way to enjoy the sunshine, whether it be taking the grand kids for a walk along the harbor, walking and talking with friends, having a picnic on the beach or a bit of fishing. 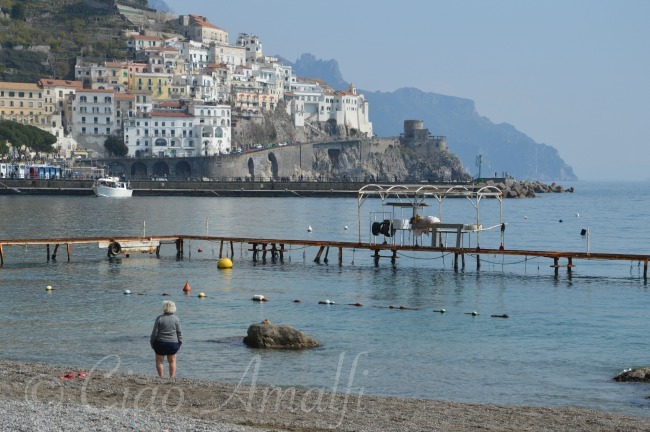 My favorite way is a leisurely walk from the center of Amalfi along the port to the very end of the pier looking back on the village. With my husband (and camera) of course! There are some people a little more eager than I am to go swimming. I must admit the water is so clear and tempting this time of year. There’s no need to rush though. The beach days of summer are sure to come, and for now I’m content with the spring sunshine, soft colors and time to watch the reflections in the sea. Even though the first signs have begun to arrive that tell us that spring is around the corner, a cold north wind blowing down the mountains the last few days has made it feel very much like winter isn’t ready to let go quite yet. I’m ready for warmth and sunshine and spending more time outdoors. The line goes that April is the cruelest month, but I’ve always been sure it was March. At least I’ve always had enough of winter by the time March comes along! But then when I look at this photo I fall in love with the winter light all over again and know I’ll miss it until next year. From the bedroom window I could see just the tip top of a mimosa with its bright yellow blooms bringing the first colors of spring. It was such a tease. Today with the brilliant blue sky I couldn’t stand it any longer. I turned off the burner under the pasta sauce bubbling away for lunch, grabbed my camera and dashed out for a little walk before lunch. I followed the maze of steps around and down and down and finally there it was. What I discovered was not just a little shrub, it was the largest mimosa tree I’ve ever seen! All these years I’ve seen that tiny little tip of yellow tempting me to go and take a look, and I’m so glad I finally did. What a glorious discovery on an equally glorious day! 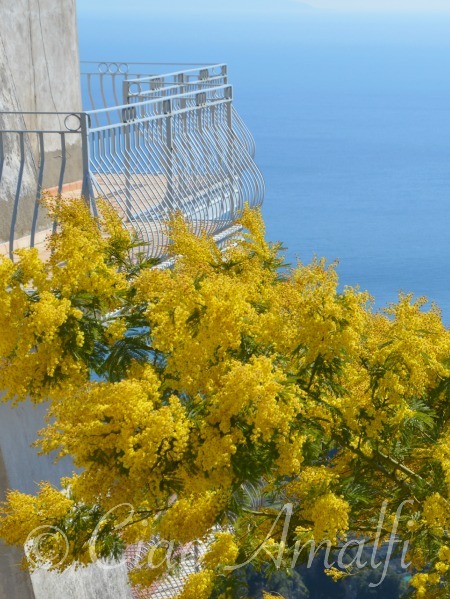 I’m just in love with the intense yellow color against the blue sea and sky backdrop. 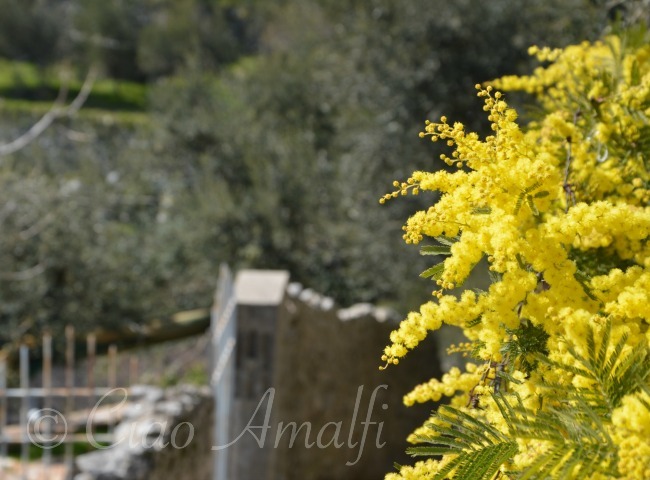 Today was finally the day to go hunting for mimosa since March 8th is the Festa della Donna, also know around the world as International Women’s Day. 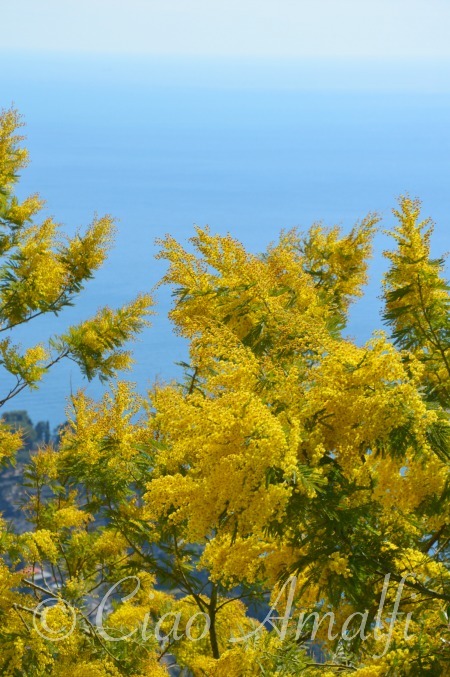 Since the mimosas bloom right around this time of year, they have become one of the symbols in Italy for the Festa della Donna. You see men carrying around bunches of mimosa flowers to give to the women in their life around March 8th. Yet for me a sunny day and break in the cold wind long enough to take these photos was the sweetest gift of all. The blooms get to stay where they belong and I can share their beauty with all of you. Many happy wishes to all of the women reading!